Once the Laurentide ice sheet began to disappear and the way south was opened, other populations also migrated into the more central parts of North America, probably finding routes to the West of the Rocky Mountains. As they spread throughout the continent, the descendants of these colonists learnt to survive in a wide range of different habitats. Initially, the colonists may have been able to rely upon animals like the mastodons, mammoth and other now extinct species of elephant to supply some of their food. But as the climate changed, these and other ice age megafauna became more and more scarce and eventually extinct, so the hunters must have increasingly turned their attention to other game. Mostly this would have been smaller animals like deer or even rabbit, but, on the Great Plains it was the buffalo which became the main target for the hunters of the Holocene. Although the Great Plains present a mainly flat and featureless landscape, in Alberta, western Canada, situated on a low plateau is a site known as Head- Smashed-In. At one point there is an escarpment, which, although now partially eroded, once stood about 20m above the plain. A stream runs towards this location fed by six tributaries, each following a course along one of the valleys fanning out from the area described. Nearly 6000 years ago buffalo were stampeded along these valleys towards the escarpment and driven over the edge to fall to their deaths, or lie maimed on the plain below. Glacial till, which included quartzite and chert left behind when the ice retreated, provided the raw materials for many of the stone tools used to butcher the animals and the weapons that helped to kill them. Small side-notched projectile points that were found at the site suggest that throwing sticks were sometimes used to launch the short dart-like spears, known as atlatl, at the animals. Initially the buffalo hunted were species such as the Bison antiquis and Bison occidentalis, now both extinct, but later on their modern counterpart Bison bison replaced them as a food resource. Nearly 6,000 years ago, on a low plateau in Alberta, western Canada, situated on a low plateau at a site known as Head-Smashed-In, a herd of buffalo were stampeded and driven over the edge of an escarpment to fall to their deaths, or lie maimed on the plain below. After the dead animals were dismembered, the meat was probably jointed and some cut up into thin strips to be placed on a drying frame to preserve it. Hunters used heavy crudely modified stone choppers to smash open the bones for marrow, then a pit was dug and lined with skins to make it waterproof. The broken bones were placed in the pit and covered in water and red-hot stones were dropped into the pit until the water began to boil, bringing the marrow fat to the surface to be skimmed off. 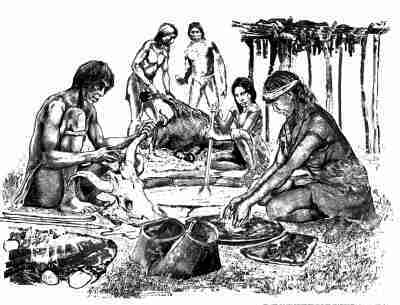 Berries and dried meat that had been previously ground to a powder were then probably mixed with the marrow fat to produce pemmican, a traditional food of Native American plains people, which would keep for months and could serve as emergency rations when fresh food became scarce.